Mic Miller once said, "Content is King", and in the case of your website, I have to agree ! 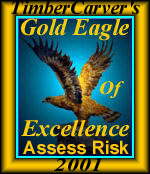 ... "Assess Risk" is now the winner of the 5th Platinum Rose Award for 2004, only the 13th (lucky 13 !) Platinum in the 2.5 year program history ! .... You will find your award attached to this email. "Assess Risk" is one of the most comprehensive safety sites I've seen, and I am so impressed with not only your re-design of the site, but also with the rich and informative content which you display on each page. I love the soft, muted color scheme, as well as the navigational system which is top-notch. And, once again, the content is just superb, as you cover every safety issue and concern that an employer/company might have. I would recommend Assess Risk to anyone who needs a comprehensive safety manual for their business .... In fact, I am going to recommend your site to my own employer, as a guideline for the new Employee Handbook our company is currently working on. Congratulations, you have a really "GREAT" site here is the Award you requested.. Display it with Pride you have Earned it!!! Dave "TimberCarver" Allerding, Delton, Michigan. We are pleased to present your site, "Assess Risk" with the Ultraweb Merit Award. We applaud the wide range of advice and free services that you provide through your site. Keep up the good work. Congratulations! Ann Bevans and Dave S.
Congratulations from the Team of Evaluators at the Ultra Free Awards Program. We have visited your web site and two evaluators have reviewed it. 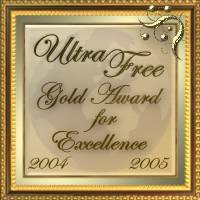 Your web site qualifies for the Ultra Free Gold Award for Excellence. Your site has earned Val's Gold Award. This Award is not easy to win! Thank you for applying.